There seems to be no end to online reviews and posts regarding the new iPad. If you are expecting me to add another proverbial piece of digital paper to the pile, you are likely to be disappointed. I have read more than a dozen reviews from various sites and bloggers whom I respect. Rather than attempt to compete with large and well healed sites who seem to have literally reviewed every nut, bolt, and chip of the new iPad, I am going to share a few specific thoughts and impressions from my week living with the new device. The focal point of the new iPad and virtually every review to date is the enhanced screen. Perhaps because of my experience with the iPhone 4 and 4S retina screen graphics, my less than perfect vision (even with corrective contacts), my inflated expectations, or some combination thereof, I was initially underwhelmed by this feature. I say initially because after several days, my appreciation of the "better than HD" screen, has been greatly enhanced. I can't honestly say what the tipping point was, perhaps it was editing some photos using Apple's new iPhoto Application which shows off the new iPad's screen and improved graphic processing speed. In fact, this iPad is a wonderful tool for photographic (and video) editing and viewing! The color saturation and detail is unparalleled. I don't own a single HDTV, computer monitor or screen (with the exception of the iPhone 4S display) which comes close to the quality of this new display. A side by side comparison of a digital photo will let you truly appreciate this change of perspective and detail. Extended reading sessions are a pleasure; the improvement in text quality is dramatic but becomes really noticeable over time. Amazon's Kindle App was among the earliest to offer an improved, "retina screen," version. Of course, Apple's iBook App also takes advantage of the iPad's higher resolution. My favorite three news and social media reader apps, Zite, Pulse and FlipBoard all have upgraded retina screen capabilities.Apps Love or hate him, I have to credit Rush Limbaugh with the same observations I have regarding the new iPad's screen. He too was "underwhelmed" initially. Whatever the reasons, after a few days I am apostle of the resolutionary experience. The rear camera has been upgraded. I used the iPad 2's camera merely as a novelty or demo. Frankly, it was a marginal addition at best on this unit. The new iPad creates crisp photos and stunning 1080p video. While holding a tablet up for photo and video shots doesn't feel natural to me, the screen provides "real time" viewing and the video is "what you see is what you get 1080p!" In other words, the screen reproduces an actual 1080p screen experience which is unprecedented. I envision using the iPad, along with iPhoto, much more extensively in the future. (I will still be lugging my Nikon DSLR and lenses with me on vacations. For many a contemporary smartphone camera and iPad will be more than adequate companions to capture your next family reunion or trip south.) Capturing HD video is another compelling reason to eschew the 16 Gigabyte model for at least one of the 32 Gigabyte versions. Some of the new iPad features I expect will ultimately make the biggest impact on consumer use are under the hood. Apple has aggressively supported Bluetooth 4.0 in the new iPad (and iPhone 4S). This technology offers much more than faster throughput for use with wireless headsets. The potential for very low power peripherals such as keyboards, speakers and more, will change your computing ecosystem. Power consumption is so low, and the "wake up" mode promises such fast access, new peripherals can go many weeks, and possibly months, between charging. Including this new bluetooth standard promises more "Apple magic" for new iPad owners over the product's lifetime. Dictation. While the new iPad doesn't include full Siri support (not because of any hardware or software deficiencies), the built in dictation mode is surprisingly fluid and accurate. You may not envision yourself talking to your iPad in full sentences and paragraphs, but after a bit of experimentation, I believe you will learn to rely upon this feature. Increased App file size makes a bigger difference than I envisioned in my earlier post on iPad purchase considerations. While I maintain that the 32 Gigabyte model is more than adequate for most users, the increased App sizes needed to support the great retina/HD display will make the 16 Gigabyte models seem cramped for many. The New Apple TV ($99) which was introduced at the time of the iPad's launch. The most notable difference between this model and its predecessor is the ability to drive 1080p video (versus 720p). The iTV software was also updated (this upgrade effects both the new iTV and the iTV 2). Enhanced 1080p video looks great on the new iPad but will be less noticable for users watching content on HDTV's of 42" or less at typical viewing distances. In fact, you may have difficulty discerning any image improvement on televisions of this size. I didn't activate my 4G cellular service for the first five days for the simple reason AT&T made the carrier decision (needlessly) confusing. As I commented in several earlier posts, AT&T decided to eliminate unlimited data plan support for all grandfathered users in the weeks leading up to the new iPad release. On the day I placed my online order for the new iPad I was working under the assumption tiered pricing would be enforced for BOTH iPhone and iPad users. Since this time, AT&T has "clarified," some would argue, changed their position, on this policy. The cellular giant is honoring grandfathered unlimited data plans for iPad users only (iPhone users are still out of luck). As a result, I reluctantly swapped my Verizon model for AT&T at the local Apple Store. (Apple has a "no questions asked" fourteen (14) day return policy.I am happy to report Apple's vaunted customer service lives up to the hype. Few questions asked (and none beyond common sensical ownership issues), my engraved 64 Gig Verizon iPad was transformed to an AT&T equivalent (sans engraving) with a bare minimum of fuss. The process was as painless as any exchange you may imagine. Apple may deal with the devils (AT&T, Verizon) but it leads and knows how to dance. I never activated Verizon's service for this area so I cannot speak toward their 4G offering other than anecdotally. I met a new iPad user familiar with Verizon's coverage in this area. He said that the 4G network was faster but "only marginally." He based this not on formal testing, but perception during the limited time he has had access with his new iPad. While I have only been on AT&T's cellular service for a few hours since trading in my iPad and transferring my cellular account, I can say it "feels" much faster, but I haven't yet performed any formal speed tests. It has been reported through reputable channels that 4G service is well received but early adopters are using monthly allotments in a matter of days. In fact, PC Magazine has scientifically determined that you can run through a 5 Gigabyte monthly data allotment on Verizon in as little as 32 minutes!! (To read about this testing as well as several useful data conserving tips, click this link.) Tip: Minimize video downloading and streaming. If you want to download video to your device, use wi-fi. There are many ways to do this, but here's a link to a post I wrote a while back on the subject. Based on numerous comments, I am convinced keeping my grandfathered unlimited data status with AT&T for as long as possible is worth the effort. Reluctantly, I have to say that the additional gigabyte of data this company offers for the mid-tier $30/month price makes this company a better choice for anyone living in coverage areas with LTE data. Heat. The hype about new iPads adding to global warming (ha) have a germ of truth. This applies to my new iPad and I suspect others. Beyond the initial charge and restore which was painful (see below), the temperature change in everyday use has been no bother and a perceived 10% increase from the iPad2. In other words, a non issue in my daily use. Charging time, not one of the iPad 2's strengths, has lengthened. While the purported ten hour battery life seems accurate, your new iPad will need an even longer recovery time than its predecessor to fully recharge. I am not sure where the epiphany will create the "aha moment" but using a screen of this resolution, forget the specs, in the palm of your hands will change your life. Leo Loporte may again be prophetic. He said, "To those who have waited to buy a tablet, you're right. This is the first iPad truly ready to transform your life." I believe history (and to a far lesser degree Leo and I) will prove just how prophetic this observation is with the benefit of hindsight. All one has to do is walk an Apple Store to see how central the iPad, and tablet computing in general is to the company's vision and our everyday life. The iPad has become the retail proxy for the company's line of laptops and computers. Beside each model lies an iPad patiently waiting to explain and detail the model's place in the Apple ecosystem. You can even use a free in store App to make genius free purchases of selected goods while at the store! Apple wants your life to be tablet focused and I believe you will too after spending time with this device. The new iPad's dimensions fall between the original and iPad 2 in thickness and weight (the width and height are virtually identical). For those of you upgrading, cases for earlier iPads should work fine. This doesn't mean that you can't easily find an excuse to buy a stylish new cover, only that you can't automatically justify the purchase to your spouse, significant other, or even yourself. One interesting aside, apparently some smart covers (the hinged, magnetic, design introduced with the iPad 2) sold by Apple and third parties prior to mid-2011 don't work as you would expect. The problem lies with a design change affecting the magnetic polarity. Apple is offering free replacements at their retail stores for those with dysfunctional covers. If you are having issues with covers manufactured by Otterbox or others, you should explore possible exchange options with them directly. I can recommend the new iPad as a "must have" upgrade for those still holding onto the original. 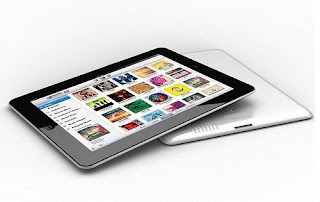 If you haven't yet joined the tablet revolution, the new iPad provides a compelling platform to begin your journey. There may well be Android tablets entering the market at similar price points in the next few months, but it is doubtful they will have a screen capable of matching the new iPad and they certainly won't have access to a half million (and growing) Apps! Enjoy! If you find this post of interest, please share through Google+, Twitter and Facebook! We welcome your comments below! We welcome your comments (which you can provide via the comment form below). Music Row Tech will never sell, give away or use your personal information with third parties. All rights reserved @2012, Music Row Tech (MRT). Any reproduction without the author's consent is prohibited. Remember your list of artists or albums? Go to your favorite search engine and search for those terms along with "free music video." You will find many excellent resources in this manner. Devotees of the Pencil stylus will be upbeat to know Apple included help for it on the iPad Pro.